Who Else Wants to learn how to start their own Opt-In List full of prospects just waiting for your next Email & Recommendation? Discover all the information you need to start building your own opt-in list TODAY! Everyone knows The MONEY is in the LIST. So why wait any longer before you start to get your own & cash in on the profits yourself? We have all heard it time & time again - The MONEY is in the List. Why ? Because it is TRUE ! The Truth is that if you are in any type of Online Marketing or Promotion, you NEED your own list. It doesnt matter if you have your own Products, are part of an Affiliate Program, or Promote an MLM Program. You MUST have your own list of prospects! Everyone knows that safelist advertising is dead. People are beginning to ignore banners. Classified sites work to a certain extent. Most people on the Internet Today are here to find information. That is where you come in! If you can provide information to people, they will willing subscribe & read your emails. It is REALLY that SIMPLE ! That is where we come in. We will take you by the hand & show you, step by step, hw to go about building your own opt-in list that is full of prospects that are waiting to receive your emails & recommendations. Once you have started your list, you will see how much easier it is to start making the income that you want from your Online endeavors! We know there are 100s of ebooks out there that say they will teach you to build your list. We know, we have bought most of them ! That is why we wrote List Building 101 - Building Your List From A to Z. Most of them tell you how important it is, why you should do it, how much money you can make - but then they STOP! Why? Because they DONT want YOU to get their subscribers!! Dont get me wrong - not ALL of the List Building ebooks out there are bed. There are some that are excellent as a matter of fact. But the truth is there just isnt THAT many. Wouldnt it be wonderful if you could find one that would walk you through the process, step by step, tell you the resources & techniques that they actually use, & help you when you need it? Well, Look No Further ! We have made learning to Build Your List easy with List Building 101 - Building Your List From A to Z ebook! There are tricks & steps to follow to build your own Responsive Opt-In List. We provide you with exactly what you really need to know and how to put those things to use. 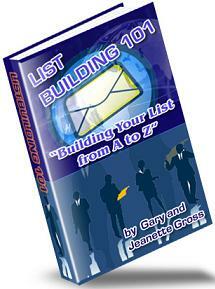 List Building 101 - Building Your List From A to Z ebook provides you with that critical information! There are many strong reasons to want your own Opt-In List. Recognition, the feeling of helping out others, profit. However, choosing the right way to do it should not be left up to chance or instinct. By making a small investment in quality information, one can learn what they need and how to use it. A quality resource can be the difference between another disappointment and a Profit Generating List. Its up to you, you can ignore this letter & continue to struggle along or learn how to bring all of what you need to know for only $47. The Content Magnet is a DESKTOP BASED content website builder that makes it so easy to build a full content rich website and upload within minutes!. Finally Theres an EASY Way To Publish Stunning PDF Files, Without Wasting a Lot of Time and Money.